A recent news about Tata’s plan to sell houses at Rs.32,000 ($700) reminded me of an assignment for the school, I wrote in March. I so regret not maintaining the blog during the MBA, so, am trying to make it up. Ratan Tata is a chairman of Tata Group of companies which is a conglomerate of around 114 companies and whose revenues in 2009-2010 were $67.4 Billion. [source] The group has operations in more than 80 countries and has interests in chemicals, steel, automobiles, information technology, communication, power, beverages, and hospitality. Ratan Tata has won several accolades for his leadership. He possesses the qualities of a level 5 leader as described by Jim Collins in his book “Good to Great”. He definitely has the mindsets required by a 21st century leader such as Boundary less thinker, network builder, diplomat, interpreter. Some of the skill sets have been highlighted below. These are some of the examples that clearly indicate the leadership practices of Tata. Analyzing the leadership using the lifecycle-culture matrix ®, Tata’s leadership falls in the realm of “Administrator”. New products are constantly being developed (be it in automobiles – new models, innovations in telecommunications – Tata Photon, lemon flavored tea bags or Tion, a new cold drink) and the brands constantly evolve themselves to attract the newer generation, increase relevance to the local market and to increase competitiveness in the market. New customer segments are constantly sought ( JLR acquisition is a simple example which helped them capture the high end segment and at the same time Tata Nano helps to capture the low segment) to maintain the growth and leadership of the organization. This quality of Tata’s leadership is visible in many other decisions that deal with wide spectrum of the market. While he led the group to acquire luxurious Pierre Hotel in New York, he also drove the launch of budget Ginger hotels in India. [source] A latest example from TCS is a cloud service application targeted at small business in India . Various product variations and extensions are not only seen in the automobile company, but also in steel, chemical and software services companies. New geographic markets are constantly being entered either by expansion or by acquisition. Tata remains competitive in the advent of new entrants to the market, reinventing itself and driving innovations in technologies and processes. As mentioned before, Tata also is very successful in growing inorganically through meaningful acquisitions and turnarounds. Thus, the business lifecycle can be said to be focusing on the customers but at the same time a sense of urgency and strategic intent can be seen. The growth of the company, given the size, has definitely not reduced thanks to the innovation and a strong strategic direction. At the same time, there are enough evidences that in some organizations, life cycle has seen a maturity. The focus on innovation and the leadership effectiveness is not similar in all organizations, one example being a failure in the passport project. [source] This raises concerns of a pending crisis in some organizations. The employee satisfaction in some of the organizations, for example Tata Consultancy Services(TCS), is not comparative to the industry standards. TCS is among the top 4 IT services companies in India comprising of around 200K employees and generating around $7B revenues. [source] At one point, it experienced lowest attrition rate in the industry [source], however its reputation decreased over the time with employees criticizing the human resources policies in public forums[source] . Through my personal interviews of the employees too I found slightly unsatisfied employees compared to the employees working for its competitors. In addition, brand trust report study lists TCS way below its competitors (Infosys, Wipro) [source]. These are the signs of some organizations moving towards bureaucracy rather than maintain the competitive edge by focusing on strategic growth. Finally, a word about the capabilities of the Tata group. Tata group as such has been technological leader in many industries. In addition as the acquisitions and the new products show, Tata group is also mature in demonstrating its strategic capability. The operational capability is not similar among all companies, although under Tata’s reign the profit margins have increased multifold. 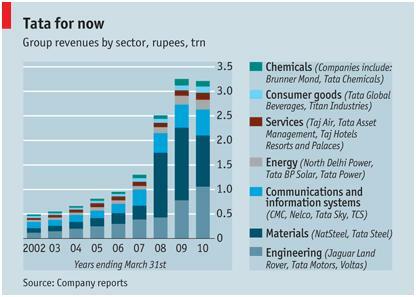 The profit margins in TCS is strong while the same can not be said about Tata Steel[source 1, 2]. While there are many factors in play for the challenges faced by different industries, it can be ruled out that the reputation and quality of services and products are not of similar stature across Tata’s companies (for example Tata Docomo , a telecom provider has not demonstrated industry leadership in its services). Most important challenge that the group faces is to find a successor for Tata. 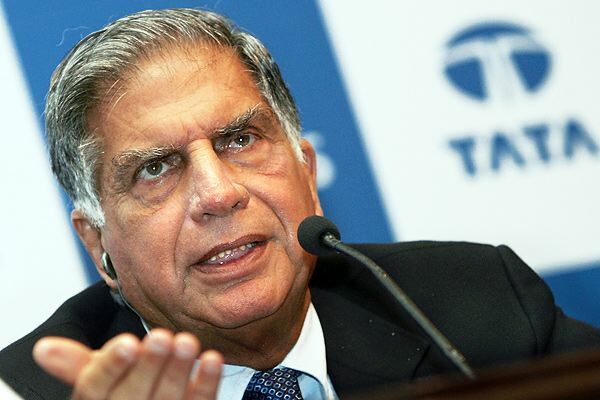 Ratan Tata, was to retire at 65, but the board then decided to change the retirement of non-executive directors to 75, thus sending out the message that Tata is indispensible. However, he has reached 75 years of age now and has refused to postpone his retirement at the end of 2012. It is a great challenge for the next generation leaders to step up to provide the similar or better guidance provided by Tata. The upper management is still dominated by Indians who only know life within Tata. Tata’s vision and personality helped group’s big transformations, restructuring and focus on frugal innovation. An example of his personality and the respect that the group commands can be seen in the fact that Corus deal met with little opposition as compared to the furore against Mittal Steel’s bid for Arcelor. The trust that Tata commands in the global finance markets can be witnesses when 75% of the deals were financed by foreign funds. It is a challenging legacy to inherit. What Tata particularly excelled was in having a vision, demonstrated abilities of thinking big, potential to grasp the opportunities shaped due to change in policies, economic climate and an unwavering execution. He rushed in the doors opened by the economic liberalization of the 90s, jumped on to the IT/telecom bandwagon, and recently focused on renewable energies such as geothermal energy. His ability to sense the synergies and strengths of his own organizations made his acquisitions a success. The next leader is desired to reflect some of these qualities and also should act in a sense of urgency not only to further focus on growing industries but also to divest interests in the not so growing industries as explained below. Another significant challenge is a re-think on the current diversification. More than 90 companies in various industries from salt to software may not be the order of the day. Tata, soon after becoming chairman, was wise enough to exit from the industries which were not attractive. Perhaps a similar strategy needs to be adopted to keep the group growing at a healthy pace and not face the risk of a decline. Given the challenges of 21st century and the impact of Tata leadership not only on the group of companies but on the entire Indian businesses, Tata group needs to put greater emphasis on the sustainability practices. In recent years, Tata Steel’s joint venture with Larsen & Toubro to construct a port at Dhamra, Orissa, has come under the scanner for its proximity to two protected areas, one of which is the world’s largest nesting site for the endangered Olive Ridley Turtle and the other India’s second-largest mangrove forest [source] . A soda ash extraction plant in Tanzania also came under fire because of the threat it poses to a nearby lake and its flamingo population [source]. In the wake of increased awareness of social responsibility among the customers and internet communication, similar oppositions will be exaggerated in a way that could be damaging to the brand. Moreover, considering the leadership Tata enjoys among Indian businesses, every action of Tata will be scrutinized and/or followed by others. There are already some efforts taken by many of the companies under the Tata group umbrellas, but they have a greater opportunity to form a consolidated sustainability that is forward looking. A centralized support that is financially independent (supported by profit making companies) can promote transparency and enable monitoring and maintaining consistent business practices across the conglomerate. Given the global operations of the organization, there are significant challenges to such a consolidation approach; however the effort will have its impact on clarity to shareholders. This sustainability leadership will be a model for other conglomerates to follow and can achieve greater objectives by being sensitive to local needs of the global organization.